When Leo (of SaveWally.org fame) posted this Rally at AirForums.com back in the Fall of '06 there was never a question of the Morrison's attending this one. This location offered us a chance to visit our old stomping grounds. Back in 1990 Katy and I were living on East 66th Street in Manhattan in a VERY small studio apartment. When we discovered Katy was pregnant with our daughter Sarah (who can be seen in the Rally photos) we decided to move to more spacious digs in City Island (also located in the Bronx). This is where we had our 26 foot sloop docked, and at the time, we were spending a lot of time on City Island. It was a natural place to move to at that point in our lives and careers. City Island and the Bronx is where our daughter Sarah (now 16) began her life. For five or so Summers we had sailed past Ft. Schuyler on a regular basis before moving the boat up to Bridgeport CT (fairer winds). Now...fast forward seventeen years to our new leisure activity - Airstreaming. So this was a bit of a backgrounder on why we were so excited about attending this Rally. The Rally location offered us the chance to visit a place where fond memories were created. And more so...a chance to camp in DA BRONX! On Friday morning my daughter Sarah and I hooked up the Airstream and made our way across the George Washington Bridge and the Cross Bronx Expressway. Yes, I had two hands on the wheel the entire way. After a short one hour ride, we arrived at the Rally site at about 1:30 pm. We met the greeting party, we were presented with our parking options. We opted for waterfront parking. We knew this Rally was going to be dry camping - no water or electric. As suggested, we arrived with a full fresh tank and empty holding tanks. The solar panels on the roof did a less than adequate job of keeping the batteries charged and our electric only fridge humming. This was our first time testing the fridge and solar package together without the luxury of shore power or power from the tow vehicle. It could be the batteries are shot. We'll have to explore that further at some point soon. So I went to Plan B - I broke out the Honda 1000 generator and ran it as needed which kept the trailer charged up and provided adequate electric for the fridge, Internet connection (can't actually ever really get away from work), and TV. No sooner were we all settled in to our waterfront piece of the parking lot we discovered it was time for Happy Hour. The central meeting place for the weekend was on the wide strip of grass between the Airstreams and the Long Island Sound. Cool breezes off the water all weekend kept us cool during the day and snuggled under the covers at night. Thankfully, there was no need for the air conditioner all weekend. Happy Hour rolled right into the Friday Night welcome reception which took place inside the Fort courtyard. What a setting! The reception featured hor devours consisting of little pizzas, an amazing cheese platter, pigs-in-a-blanket, and deli and veggie platters. Soft drinks were provided and anything more was BYOB. We all sat at tables positioned around the center flag pole. The event was of course lively with people table hopping all the the reception. As the Sun set the reception came to a close and we moved on the next part of the evening. Sarah and I were expecting friends who live in the area to spot by for a visit. No sooner did we get back to the trailer from the reception when Pat and Jill and their children rolled in to pay a social visit. We sat with them for the balance of Friday night. They got a brief taste of Rally life with Metro NY folks stopping by to chat and say hi all night long. It was great catching up with old and dear friends at such an amazing setting. Saturday morning rolled around quick - a little too quick for Sarah and I - yup...we missed another Rally breakfast. Seems to be my M.O. at Rallies. While Sarah took her time getting ready for the day, I took a bike ride around the Fort and college campus. After the bike ride I made my rounds visiting with Rally go'ers and handing out brochures for Jersey Shore Haven Airstream Park where we are shareholders and I presently sit on the Board of Directors. Many of the Airstreamers I handed brochures to have already been to Shore Haven, but I was more surprised by the many who had not heard of Shore Haven and did not know about the many Airstream only Parks located around the country. You can check out links to them on my Airstream Links page. Anyway, it was fun chatting it up about a place we love so much. Once Sarah was ready, it was time for us to drive over to City Island to visit her first home, have lunch at the City Island Diner, and shopping for groceries. It was a fun and reminiscent excursion for me - Sarah seemed non plussed by it all - it's hard to impress a 16 year old girl who has no recollection of living there. All I can say is the memories of our life in City Island were fond ones. Twenty-somethings with a new born, commuting by bus and subway to Manhattan, and hanging out nightly in the boat yard. Good times for sure. 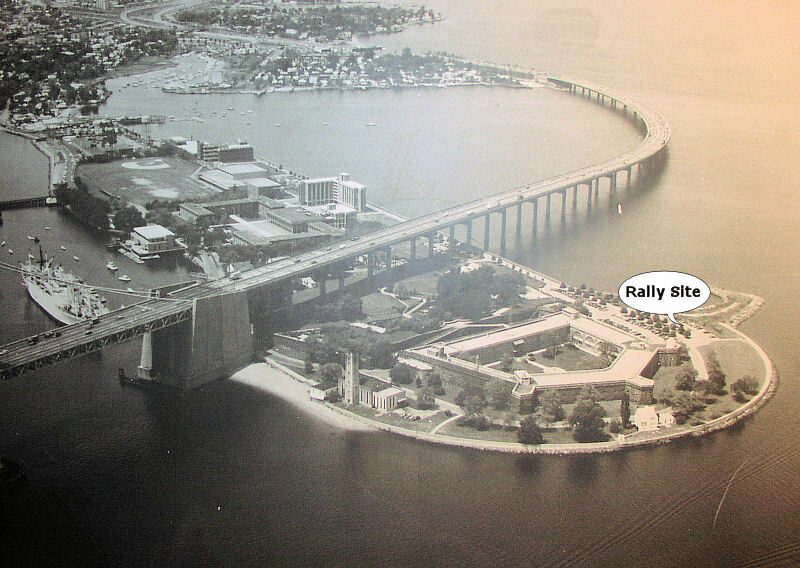 After our trip to City island we high-tailed it back to the Rally. By this time our trailer guests for Saturday night had arrived - fellow Watchung Unit members and good friends Geoff and Dee. While Geoff and Dee continue to prepare their '68 Safari for travel on the open road, they have been our overnight guests at a couple of Rally's now. Come on Geoff -- grease those bearing, check your breaks and running lights and get that rig on the road! Needless to say they are Airstreamers, easy company, and we love having them put the front goucho to use. Our group of Watchungers - Geoff and Dee, Hunt and Sue, and me and Sarah, spent part of Saturday afternoon touring the Fort's maritime museum. The museum offers a wonderful presentation our our Nation's maritime history with hundreds of ship models and maritime equipment displays. Later in the afternoon Geoff was a big help with my personal afternoon Rally chore - tuning in our new to our DirecTV dish. Once we figured out where SW was, we locked on to DirecTV's satellites and..'Houston we have a signal.' Not that there was any time to actually watch it - we were at a Rally after all - it was good knowing the new toy worked. It should help keep the teens entertained in Perry later in the month. Saturday night's Happy Hour - was held away from the water and closer to the Fort wall - remember my mention of those cool breezes? The Saturday Happy Hour was lively and offered a huge spread of delicious hor devours. And as with all Rallies, Happy Hour rolled right into dinner. Dinner took place in a dining hall situated on the East river side of the Fort (opposite side from where we were camping). The second floor location featured beautiful views of the Throgs Neck and Whitestone Bridges and the Manhattan skyline. Someone pinch me! It was a gorgeous spot for dinner and the food was excellent. After dinner and desert, and as part of the NY Metro Unit's 50th Anniversary celebration, many of the Metro NY Unit past presidents who were in attendance, were introduced, publicly thanked for their years of dedicated service to the Unit and WBCCI, and they were presented with plaques saying so. After the introductions the evening rolled into a slide show of photos provided by ???? (please email names to me at dave@dwmorrison.com) from their family's personal photo collection. The slide show featured photos dating back to the 1959 International (Colorado Springs). Wally Byam, the man, was in one photo where it was seen being presented with his birthday cake. This was just after he had arrived back in the States from the Capetown to Cairo Caravan. The slide show and personal accounts provided by ??? and his daughter were priceless. Saturday night was capped off with a bonfire out by the water. All gathered around the fire pit and shared in Airstreaming camaraderie. It was a fitting end to a great Rally day. Sunday saw the usual hugs, handshakes, and good-byes to old and new friends. Sarah and I hooked up the trailer and were on the road by 12:30 pm after the obligatory visit to the designated dump station provided by the kind folks at Ft. Schuyler. we learned that the Metro NY Unit's motto is "Not the biggest - but the friendliest". Those folks know how to have a good time and they certainly live up to their motto. Every member of the Metro NY Unit made us new-comers feel incredibly welcome. There was a rumor floating that Ft Schuyler will be on their Rally schedule again in 2008 and they may add a much desired day. All I can say...and I hope this sums up the good time we had...Leo, please put the Morrison's on the Rally attendee list as soon as you form it. This Unit Rally is not to be missed! The Metro NY members and the Ft Schuyler location (yes...da Bronx) are top notch.